Boston entered the game with a record of 24-22: far behind their blistering pace of a year earlier (41-10). They were in third place, 2½ games behind the Detroit Tigers, and two games in front of this evening’s opposition, the Chicago White Sox. Ted Williams, en route to his second Triple Crown-winning season, was mired in a slump, hitting just .186 (8 for 43 with 2 HR and 6 RBI) in his last 16 games, and his batting average for the season had fallen from .337 to .291. Meanwhile, Dom DiMaggio had been out since June 2 with a left shoulder injury. Rookie right fielder Sam Mele had slid over to center in his absence, with Wally Moses taking Mele’s place in right. But with lefty Frank Papish pitching for Chicago, the left-handed-hitting Moses was replaced by right-handed Leon Culberson. Papish, a lifetime 13-11 pitcher, was hardly a star, but he entered this game riding a streak of 27 consecutive scoreless innings pitched, having not given up a run since the sixth inning of a game against the St. Louis Browns on May 27. Since then Papish had pitched two scoreless innings of relief, a complete-game shutout of the Philadelphia A’s, and 13 scoreless innings against the Washington Senators on June 8. Papish’s performance against the Senators was not enough to earn a victory, as Walt Masterson pitched 16 scoreless innings of his own, and Washington triumphed, 1-0 in 18 innings. Tonight, Papish was opposed by Boston’s Boo Ferriss, who had posted a 25-6 record in 1946, but had already lost five games in 1947. Third baseman Floyd Baker of the White Sox became the first batter to step to the plate at Fenway Park after dark, and lined out to Red Sox third baseman Don Gutteridge for the first out. There were no special pregame ceremonies to mark the occasion, unlike at Braves Field a year earlier.13 The 34,510 fans in attendance were in awe of the radiant atmosphere created by the new lights, “startled” by how bright they appeared against the darkening skies.14 Ferriss’s struggles continued as the White Sox collected 11 hits off the righty, beginning with a single by Dave Philley in the first inning. (Ferriss failed to record a clean inning in the game, lasting just 5 1/3 innings.) Chicago later pushed across single runs in the third and the fifth for a 2-0 lead. White Sox manager Ted Lyons, mindful of Papish’s long outing five days earlier, pulled him from the game and inserted Earl Caldwell, who promptly gave up an RBI single to Sam Mele to move Boston ahead, 3-2. Bobby Doerr then hit a grounder to short and was ruled safe at first when Luke Appling’s throw pulled Jake Jones off first base. Both Williams and Mele scored, and while Jones complained to first-base umpire Bill Grieve about the call, left fielder Jack Wallaesa ran into the infield to confront Grieve. In the words of Boston Herald sportswriter Burt Whitman, Wallaesa “appeared on the verge of going berserk”16 before he was ejected for protesting too emphatically. The White Sox drove Ferriss from the game with another run in the sixth, which ended the scoring. The Red Sox sent their fans home happy — at approximately 11:20 P.M. — with a 5-3 victory. Photo credit: Courtesy of the Boston Public Library, Leslie Jones Collection. 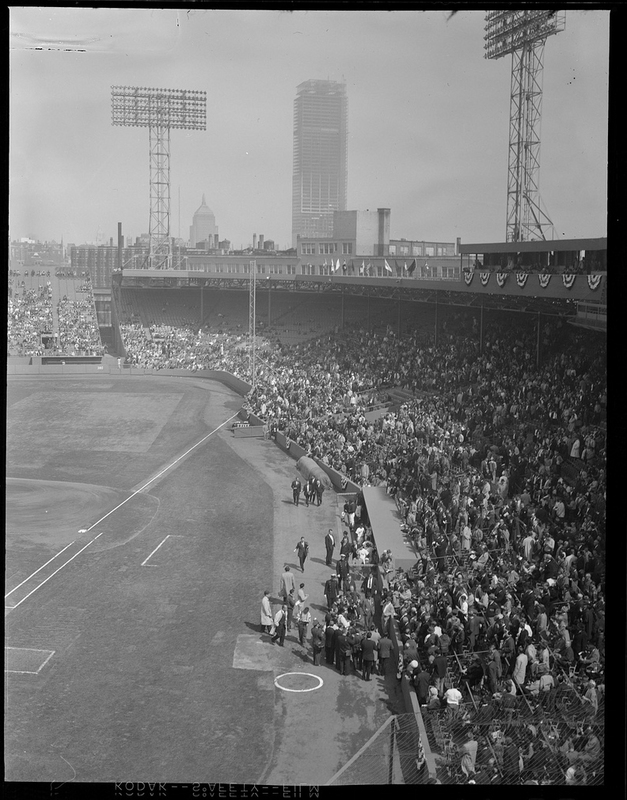 1 Melville Webb, “Red Sox Have Plans Set for Night Games but Need Material,” Boston Globe, May 3, 1946; “Red Sox Seek Permit to Erect Towers on City-Owned Property,” Boston Globe, May 30, 1946. 2 Hy Hurwitz, “Yawkey Will Get View of Revamped Sox Park Today,” Boston Globe, April 10, 1947. 3 Melville Webb, “Pile Driver’s Thud Harbinger of New Fenway Floodlights,” Boston Globe, January 5, 1947. 4 Henry Wilson, “Red Sox Infielders Don’t Alibi Errors on Their Groundkeeper,” Boston Globe, April 27, 1947. 6 Webb, “Pile Driver’s Thud Harbinger of New Fenway Floodlights”; “Brighter Outlook as Fens Turns on New Lighting System,” Boston Traveler, May 27, 1947; “Fenway Park Gets Lights,” New York Times, January 5, 1947. The 1,120 floodlights were to be divided as follows: 144 first base, 144 third base, 168 left-field roof, 96 left-field tower, 160 center field, 168 right field, 240 between first base and right field. The Yesterday’s Game website features a photograph from the General Electric archives showing the towers above the left-field wall before the ads were painted over (the 1946 Boston Yanks football schedule is still visible at the lower left): yesterdaysgame.net/bos-1947-1975-perspectives.html, accessed May 19, 2018. Note on Yankee Stadium’s usage of L-69s is taken from “Conference on Lighting Opens Today,” Schenectady Gazette, September 23, 1946. 7 “Sox Park Has Dress Rehearsal of Lights,” Boston Globe, May 27, 1947. 8 “Brighter Outlook as Fens Turns on New Lighting System,” Boston Traveler, May 27, 1947. “Fenway Park Lights Brighter than Team,” Boston Traveler, May 28, 1947. “Things Brighter at Fenway Park — Lights On,” Boston Herald, May 27, 1947. 9 George C. Carens, “Fenway Lights People’s Choice, Admits Yawkey,” Boston Traveler, April 11, 1947. A limit of 14 night games was common practice at the time, but the Boston Braves planned to play 29 in 1947, and the Senators and Cardinals hosted over half of their games after dark. See the Retrosheet original regular season schedule file for 1947: retrosheet.org/schedule/1947SKED.ZIP, accessed May 19, 2018. 10 Burt Whitman, “Hot Red Sox Christen Lights Tonight,” Boston Herald, June 13, 1947. 11 Bob Holbrook, “34,510 Watch Sox Win, 5-3 in First Fenway Night Tilt,” Boston Globe, June 14, 1947. Sunset was at 8:22 P.M. per “Miniature Almanac,” Boston Globe, June 13, 1947. Gordon Campbell, “Sox-Chisox Tilt Tonight to Draw Capacity Crowd,” Boston Traveler, June 13, 1947. 12 Burt Whitman, “34,510 See Sox Win First Night Game,” Boston Herald, June 14, 1947. 13 Hy Hurwitz, “Sox to Play First Fenway Night Tilt,” Boston Globe, June 13, 1947. The Braves pregame festivities are described in the SABR Games Project account of that game: sabr.org/gamesproj/game/may-11-1946-braves-field-hosts-its-first-game-under-lights. 15 Irving Vaughan, “Boston Defeats White Sox, 5 to 3,” Chicago Tribune, June 14, 1947. 17 Retrosheet schedule data reveals that Yawkey and the Briggs family in Detroit continued to schedule 14 night games a season through 1956, fewer than any other team except the Cubs, who didn’t install lights at Wrigley field until 1988. In 1956, for example, the other 13 teams scheduled an average of 34 night games. In 1957 the Red Sox scheduled 18, and the Tigers, under new ownership, scheduled 21. These figures do not include games made up as part of doubleheaders, or otherwise rescheduled during the season.